Dodgers lose to the Rockies 5 to 3. Is This Crazy or Brilliant? As some you of you know, the 29th Annual National Sports Collectors Convention is taking place the weekend of July 30th to Aug 3rd in Chicago. This is the prominent show in the hobby. Dealers from across the country come out to show their best stuff. For vintage collectors this is the place to go shopping. All the card manufacturers give out free promos and autograph guest from every sport imaginable show up. It's a show you don't want to miss. To add some mystique, the National and Sportsbuy.com have come together to offer the most hated Cubs fan of all a crazy deal. 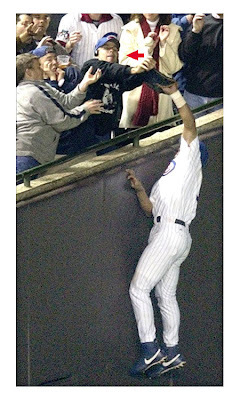 They are offering Steven Bartman, the idiot who interfered with that foul ball, $25,000.00 to come to the show and put his autograph on the picture below. Is this crazy? Will he even show up? Is this a big set up? Who knows? All I do know is that the Chicago press is starting to report it and this Baseball fanatic city is bound to go a bit nuts about the whole event. 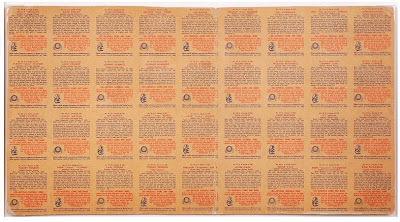 Thanks to collector Bob from NY I get to show off his uncut sheet of 1949 Bowman Baseball cards. 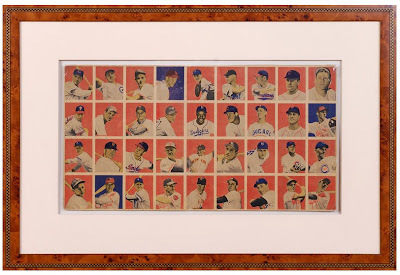 It has 4 rows of 9 cards each and features, prominently in the center, Jackie Robinson. This is his Bowman rookie card. The consistent red backgrounds on the sheet give it a art deco look. The best thing about how this is displayed is that you can see both the front and back of the sheet. If you are interested in the piece I know Bob would look at any offers, just let me know and I'll send you his email. OK. Now I'm just trying to catch up. 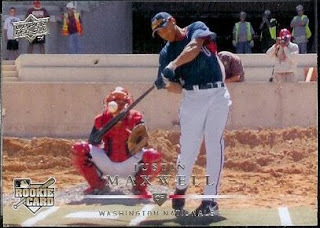 The Card of the Week, however belated, is a 2008 Upper Deck card of Washington Nationals outfielder Justin Maxwell, #325. Justin is taking a swing while up to bat inside Nationals Stadium during construction. Construction workers stand in the background. One fellow is on the right taking his own photo of the spectacle. 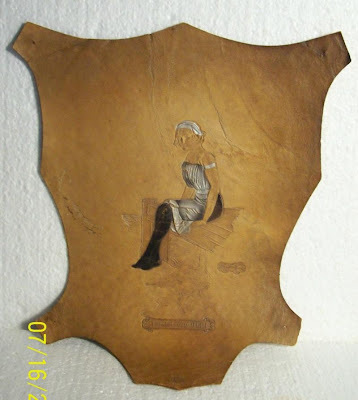 Thanks to Roger, who sent me an email pointing out these auctions, I get to expand a bit on the leather tobacco inserts I wrote about a month ago. Below is a collection of leather premiums that sold on eBay last week. Instead of Baseball players featured on the face like the L1's these leather items feature the ladies. They are called Hamilton King Girls and are commonly known as L5 in the standard catalog. They measure 8.25" X 12.50" and where redeemed through with a collection of coupons in packs of cigarettes in 1908. These leathers appear to highlight women from different parts of the country and their hobbies. Check them out below. Above is the Atlantic City Girl and sold for $224.72. Below is the Coney Island Girl which sold for $133.50. What is unusual about these leathers is how different they from the Baseball version. 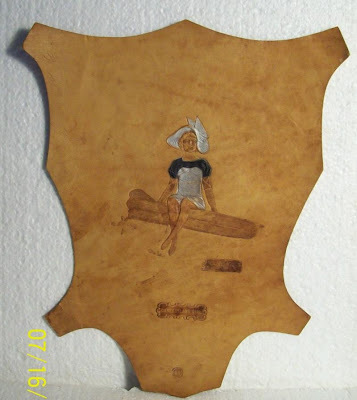 The Baseball leathers had drawings printed on the front. 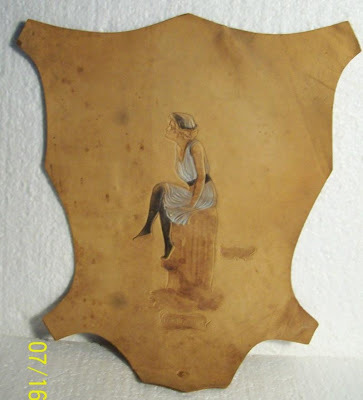 These Hamilton Girl's are pressed into the leather to give it texture and then painted. Below is the Long Beach Girl which sold for $207.50. The below item has me scratching my head. What exactly is a Comfort Girl? My imagination is running wild. It sold for $99.99. UPDATE: Well, Roger tells me that this is actually Old Point Comfort which is a beach in Virginia. Whoops!! Below are links to 6 other leathers that were on eBay. UPDATE: Wow! Roger has a heck of a collection. He has sent me a link that features numerous other L5 leathers. Check them out here. 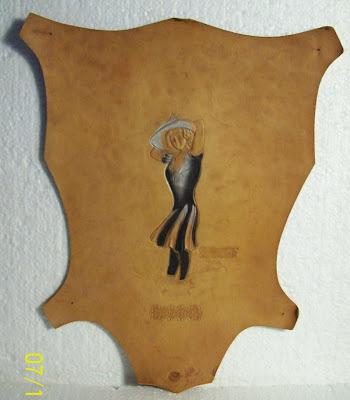 Also, here is a link to a great website within the Vintage Non Sports Card Chat Board featuring all kind of early 20th century leather tobacco premiums.